Android: Google's Dream, Apple's Nightmare? A new smartphone is debuting on Sept. 23, and, no, it's not just another iPhone clone. 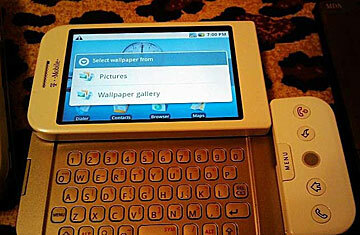 The HTC Dream from T-Mobile will be the first handset to run Google's new mobile operating system, Android. And while it won't look as sleek as the iPhone, it promises to give mobile-phone users a lot more freedom and flexibility. Many of the Dream's features are under wraps until launch, but based on leaked photos and videos, along with screen shots released by Google, we already have a pretty good idea of what to expect. The biggest departure from the iPhone design is the inclusion of a physical keyboard, which apparently slides out from underneath the Dream's touchscreen. The Dream will also allow users to run multiple applications at once and more easily share contacts and data among them. And if reports from developers interviewed by TIME prove true, mobile-phone users will finally be able to cut and paste text in e-mails  a function that's frustratingly absent on the iPhone. The Dream, which is expected to go on sale in late October, will reportedly cost the same as the 3G: $199. The sweetest part of the Dream is the Android Market  Google's answer to the Apple App Store. Whereas many Apple apps cost money (typically anywhere from $0.99 to $9.99), at launch all Android Market apps will be free. That includes BreadCrumbz, a picture-based navigation program that doesn't just give you a drawing of your route; it also includes real-world photos to keep you on track. Another interesting app, TuneWiki, is a tricked-out music player that encourages mobile karaoke by synchronizing a song's lyrics onscreen with its YouTube video. It also shows you what songs other TuneWiki users near you are listening to in real time. Since Android is better than the iPhone at running multiple programs at once, you won't have to choose between apps: as BreadCrumbz helps you find your way to a party, TuneWiki can play your favorite Rihanna video and get you in a groovy mood; when it's time to make a right turn, BreadCrumbz will cut in and alert you. Android has several other key advantages over the iPhone operating system. While Apple takes a top-down approach to app development  the company must approve every program that makes it into its App Store  Google will allow creators to upload any application to the Android Market without its review. Sure that means some duds will make it in, but it will also allow a much more open and democratic way for favorites to evolve. Perhaps more significant, users will not be limited to a single phone or carrier for long. While T-Mobile's HTC Dream will be the first phone to run Android, Google is inviting all carriers to develop handsets for the platform. Expect to see other compatible devices early next year. Most of the Dream's other features are expected to go toe-to-toe with the iPhone, including built-in GPS, a tilt sensor for gaming and a camera. What's more, T-Mobile recently expanded coverage for its 3G data network to 27 major cities. The faster bandwidth promises to make watching videos and downloading websites go smoothly, but if the spotty 3G coverage offered by AT&T for the iPhone is any indication, buyers should treat this promise with deep skepticism. On the downside, don't expect the Dream to be anywhere near as slick and shiny as the iPhone. T-Mobile may be much loved among teens for its colorful, flip-screen Sidekick, but the HTC Dream will likely have a more staid look that lacks the iPhone's panache. Plus, no one can turn on the hype machine quite as well as Steve Jobs. But whatever the Dream may lack in flair, it's no less of a breakthrough when it comes to giving mobile-phone buyers more ways to connect on the go.